GWT Earthmoving has more than 30 years experience providing reliable earthmoving hire services in Queensland. We hire out modern earthmoving equipment with qualified & experienced operators, all of our operators are industry professionals with current licenses and safety certificates. earthmoving equipment we see ourselves as your 'One Stop Shop' for all your earthworks needs, be it Civil Earthworks - Road Construction, Drainage Solutions, Commercial Earthworks - Bulk Earthworks, Detailed Earthworks, Residential Earthworks - Land Clearing, Retaining Walls, Rural Earthworks - Dam Builds, Fire Breaks. Earthmoving equipment hire Brisbane and South East Queensland, we look to supply modern earthmoving equipment with qualified and experienced operators. All our operators are highly trained and skilled industry professionals with current operating licenses and Safety Induction Cards. The founders of the company focused in instilling their passion and drive for hard work, quality machinery and high competency into the team at GWT. 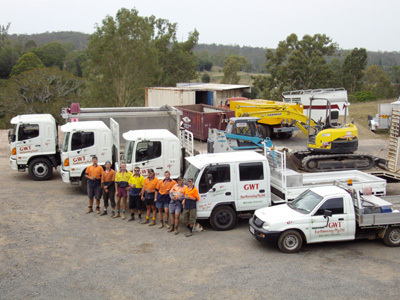 Establishing GWT Earthmoving in 2004 capitalising on over 35 years gained vast knowledge and experience on the road providing earthmoving equipment Brisbane. GWT earthmoving Brisbane is more than just a company with a solid reputation and recognition in South East Queensland. It provides excellence and extensive, knowledge-based information, and job specific equipment, designed specifically to handle any earthmoving work required. We have an amazing management team and workforce who are equipped with the most modern machinery, prepared and trained to get the job done as and when needed. With an exceptional working relationship with all our clients as reliable local providers, earthmoving companies Brisbane, we are pioneers in our field. We also share close ties with other contractor and construction companies, enjoying a mutual understanding and respect. At GWT Earthmoving we proudly share our extensive local knowledge base and network system, which offers significant resources to fulfill the job at hand efficiently and competently. This ensures every individual client's project that we contribute to is completely satisfied that the equipment meets the specific project objectives and the work is being delivered on time and within specifications; this has helped us build a larger and loyal customer base, across civil construction companies, property developers, builders, councils and private domestic clientele. Our entire team of earthmoving contractors Brisbane contribute to each and every project we work on in one form or another, as each team member’s knowledge and prior experiences is highly valued and crucial to the greater whole. Every individual member of the team is work driven, motivated, qualified and experienced – the management team have put in great effort to form such a team. Polishing each individual’s unique skills and intellect in their field of expertise, their aim is to continually train, upgrade and enhance their information and knowledge base so they can continue to deliver outstanding performance, by recognising the importance of continued and ongoing skills training. Our earthmoving workforce has a highly commendable work and safety history. Paying very strict attention to equipment maintenance and on the job situational awareness. Minimising the risk to equipment, utility services and personnel. With an extensive range of trucks, excavators and other heavy-duty earthmoving equipment, GWT Earthmoving can deliver irrespective of the local or existing terrain. We provide all manner of tools and attachments under our "One-Stop-Shop" modus operandi minimising lost time due to un-seen, but potentially anticipated situations - Experience wins the day. GWT earth moving Brisbane is an acknowledged expert in its field with deliverable know how to manage and produce the best quality project services to out shine all other rival suppliers in the market. The services you will find at GWT Earthmoving are deemed above current industry services standards ensuring we win, gain the trust and loyalty of clients. The Brisbane earthmovers at GWT possess the know how to provide the utmost best in customer services and equipment to meet each project specification demands, time objectives and trump any unforeseen job requirements. Yes, every employee is well equipped to take on this responsibility without a shadow of a doubt. They not only possess extensive knowledge about the various tools and machinery, but also know how to operate and use all of the plant and machinery, having acquired the prescribed safety certificates and licenses to function with full confidence and thus circumvent potential on the job hazards or risks. Brisbane earthmoving know what to do and how to get it done. With a fleet of modern, well-kept and regularly maintained plant and machinery equipment, the company projects itself as an proficient, efficient, competent professionals in the earthmoving industry. All machinery come fully tooled for the job specifications, with redundancy systems and replacement attachments to be called upon when needed in case of mishap or malfunction; this way, there are reduced delays and machine down time. This allows for smooth running, timely execution of the work and greater flexibility in meeting project demands and maintaining company standards of expected customer service. With our earthmoving equipment hire Brisbane and South East Queensland on your side, consider your project in solid experienced hands. With a vast variety of heavy-duty machinery at hand ready to take on your project, any concern on availability and timely completion of the project can be readily allayed. Subject to the projects specifications GWT have undertaken a wide range associated services, along with providing the correct heavy machinery and skilled ticketed operators we can facilitate materials to be supplied and installed, for example; boulders and rock, geo-fabric material, road base, gravel, logs, sand etc. As with any project we provide comprehensive consultancy and liaison between all stakeholders associated whether it is project managers, government departments, local councils, engineers, surveyors, forepersons, sub-contractors and even where necessary private land owners who may have adjacent properties. Underlying everything here at GWT Earthmoving is our founders focus on passion and drive for hard work, quality machinery and high competency into the team. As a family owned and managed company it should then not come as any surprise that all our earthmoving contractors Brisbane are personally trained in situational awareness to avoid or minimise all sorts of potential mishaps and incidents that could possibly occur to due to lack of common sense, knowledge or proper usage of the equipment. We strive to provide a safe, happy and healthy team environment. GWT Earthmoving values and acknowledges its responsibilities to not only their team members but also towards their respective families, to ensure a safe working environment and at the end of each day that they (the team) return home safe and sound. The responsibilities and commitment adopted at earthmoving hire Brisbane within its safety programs for a safe working environment represents the cornerstone and pathway into the companies long term corporate objectives. It is pivotal to the continued growth and prosperity of the company. We are continually working on gradual, orderly and continuous improvement across all aspects of our business. Our company ethos of "continual improvement" is a culture of sustained continuous improvement focusing on attainment of higher standards in all facets of operation, equipment and human resources. This strategy involves everyone working together to make put forward suggestions and improvements without impediment. GWT Earthmoving invests considerable time and effort to live up to the needs, wants and expectations of its people - In turn what is also expected from the team. Sets of manuals and guidelines are provided to ensure each individual has full awareness of what the company strives, expects and at times demands - Be it for fundamental business objectives or OH&S; requirements. GWT Earthmoving has not only left other earthmoving companies Brisbane behind, but has set itself as a role model and leader. All senior personnel are well versed in OH&S; and are committed to passing their experience and knowledge to the junior members of the team. All staff is aware of their OH&S; obligations and are trained and competent before attending any work site. All accidents and incidents are reported, investigated and openly discussed to prevent re-occurrence. All GWT equipment, whether plant, tools, trucks or support vehicles, is maintained to the highest standards with training and induction being provided to all personnel prior to use. In the unlikely event a GWT staff member does suffer injury or illness, a rehabilitation program is implemented to assist and encourage the member to return to full duties. GWT Earthmoving invests significant time, energy, effort and capital to bring the most competitive and best value to the earthmoving industry. We have developed extensive and comprehensive rules for safe working procedures to be adopted for each and every activity and operation. We have very strict employment criteria, which help us ensure that all tem members are capable and proficient enough to avoid any technical, mechanical or physical dangers. There is no doubt that GWT Earthmoving is the best of the best in terms of excellence, quality and value. If you desire the best and demand value for money, pick up the phone and call us right away!